Lovely Granta, who publish Indonesia Etc. in the UK, Australia and many Commonwealth countries, have generously agreed to try a new experiment: they are making the e-book available for next to nothing to people who have already bought the hardback. 2) With your smartphone, take a photo of the whole cover of the book. 4) Take a photo of the copyright page. Your Google Play/iTunes account will be charged 99c, and the folk at BitLit will send a link to both ePub (iBooks, Kobo etc) and .mobi (Kindle) versions to the e-mail account associated with your downloads. Bitlit have provided nice, clear, visual instructions to help. The whole process took me less than three minutes. Why is Granta doing this? Why would any publisher, in these difficult times, give something away so cheaply? Because they are willing to experiment with new ways of making their readers happy. I hope this bundling will make many people happy because I think a lot of readers are like me: hungry for good books, but a bit skint, and forced to make choices. I love the look and feel of a well-produced book (and Granta’s edition of Indonesia Etc., with its gorgeous cover by Rod Hunt and its lovely fold-out map, is definitely well-produced). But I also like to read on the move, to carry non-fiction books with me for reference, and to search books electronically. That, and the cheaper price, often tips me towards the electronic version; I’ve never once been able to afford both. BitLit’s technology and Granta’s generousity have removed the dilemma in territories where you are allowed to buy their edition. Granta are doing this as an experiment, so if you think it’s a good idea (and if you’d like to see them do this with other books, past and future) email Granta to thank them for trying it out with Indonesia Etc., and to make your suggestions. Happy Id-ul-Fitri, dan selamat membaca. 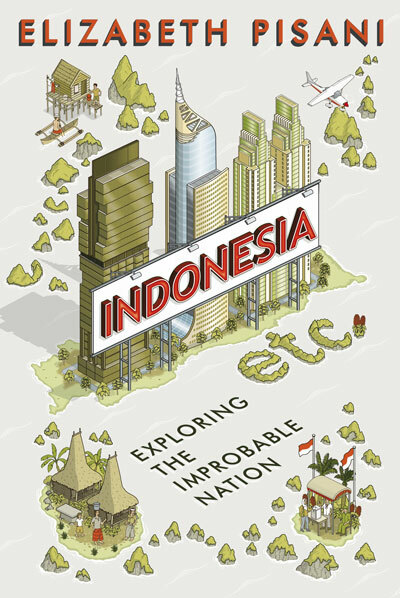 2 Comments on "Generous Granta: Indonesia Etc ebook for (almost) free"
So I can take a picture of the book in a shop and order the e-book for almost nothing.. Seriously, I don’t think this is a good business case. Maybe for this specific book which has a certain type of readers with a connection to the writer, but for a more general type of book, like novels, it will be taken advantage off because it is more ‘anonimous’ for them to do so. You have to write your name on the copyright page and photograph that, too. The assumption is that people intelligent enough to want to read a non-fiction book about Indonesia are also reasonable enough not to go around defacing books in shops.